The Justice Ministry on Wednesday granted one-year stay permits to 339 of the 458 Yemeni asylum seekers staying on Jeju Island, while granting actual refugee status to none of the applicants. 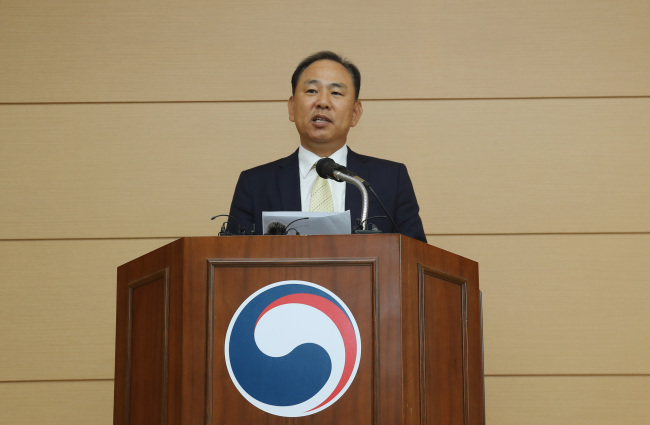 In a press conference, Jeju Immigration Office chief Kim Do-kyun said 339 Yemeni asylum seekers had been granted the one-year humanitarian stay permits, while 34 individuals were denied both the right to stay and refugee status. The office said it is still deciding on the cases of 85 applicants. Among the total 481 Yemeni asylum seekers that applied for refugee status after arriving on Jeju Island from early this year, 365 are now allowed to stay in the country for a year. The Jeju Immigration Office has already given the humanitarian stay permits for 23 Yemeni asylum seekers earlier in September, as they include minors, families with young children or those that needed medical treatments. For the Yemenis permitted to stay here for a year, the immigration office said it will also scrap the travel ban and allow them to move to peninsular South Korea. The office had banned the Yemenis on Jeju Island in April from leaving the island and entering the mainland. The government would be able to monitor the whereabouts of the asylum seekers staying under the humanitarian permits, as they are mandated to report the residence to the respective provincial immigration offices, the Jeju Immigration Office added. The decision on 85 of the Yemeni refugee applicants was postponed, as some of them needed additional screening and some could not be interviewed due to schedule conflicts. But none of the applicants were granted official refugee status in Wednesday’s announcement because they did not meet the criteria for the status, according to the immigration office. The Refugee Act defines a refugee as a person who is likely to be persecuted based on race, religion, nationality, status as a member of a specific social group or political opinion. Evacuees from war conditions, therefore, cannot be accepted as a refugee in Korea, according to the Justice Ministry. The one-year humanitarian stay permits are given for those who fail to meet the criteria for refugee status but are considered to have a need to stay in the country for other circumstances, such as armed conflicts back home or health conditions. The refugee law prohibits compulsory repatriation of any recognized refugee, humanitarian sojourner or refugee applicant. Before the one-year term expires, the asylum seekers will have to file a separate application should they want to remain in Korea longer. If the current situation in Yemen improves and there is sufficient evidence that it is no longer unsafe for the asylum seekers to return to their home country, the permit will be refused, a Justice Ministry official said. As for the 34 Yemenis who were denied in their refugee applications, the immigration office explained they included Yemeni nationals who were born outside of Yemen and had a safe place to stay but came to Korea for job opportunities. Those that fled their home country to avoid criminal charges were also rejected. If they file an objection or administrative litigation they may stay on Jeju Island during the court proceedings, but will not be allowed to travel to other areas of Korea, according to the immigration office. As for those who received the stay permits, the immigration offices with jurisdiction over their respective residences will offer society adaptation training programs, including Korean classes and social regulation courses, the immigration office added.